Since 2016, Climate Interactive has worked with partners, like the Mohammed VI Polytechnic University in Morocco, to cultivate climate leadership across Africa by building capacity to bring World Climate Simulations to communities and groups. 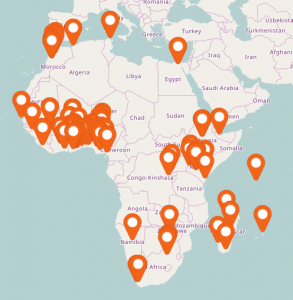 Through this, we have elevated the reach of this tool throughout Africa and collaborated with governments agencies, universities, think tanks, non-profit organizations, and private companies. We offer trainings via our bi-monthly online webinars and one-on-one facilitator trainings to equip people interested in becoming facilitators. As a result, we have appointed two World Climate Ambassadors from Africa and have a dozen other facilitators spreading World Climate to 20 African countries. Join us as we spread awareness about what we can do to address global warming while also adapting to the consequences. To learn more about the partnership with the Mohammed VI Polytechnic University, visit: https://www.climateinteractive.org/project-news/new-partnership-with-moroccan-university-to-elevate-climate-awareness/ and have a look at various events featured in our blog and our gallery on Flickr. Event Details: Climate Interactive will facilitate a World Climate Simulation at the Africa Climate Week coinciding with the Africa Carbon Forum held at the UNEP Headquarters in Nairobi, Kenya. World Climate is an interactive simulation of the international climate negotiations. Developed by Climate Interactive and MIT, this model-based game parallels the UN climate change negotiation process. Participants will play world leaders who must produce a global agreement to reduce CO2 emissions enough to limit global warming well below 2°C. Their agreements will be tested on our policy simulator, C-ROADS. Join us to experience what it’s like to negotiate a climate deal and address one of the greatest human and environmental challenges of this century. At the end of the session, participants will gain insights into the possibilities of success in addressing the climate challenge. They will also learn about systems thinking resources being developed by Climate Interactive such as the Multisolving tools and the Agriculture model for selected African countries – Ethiopia, Rwanda, Ghana, and Morocco. Registration for this event has now closed. Selected participants will be contacted in due course.